We are excited to finally announce our casting team! Each is a pillar of the community, and we are happy that they will be gathering under one virtual casting booth for TSL3. The four featured casters will each get an opportunity to cast with one another -- all main caster combinations will happen! Blake "Chill" Muzar is a long time face of the TSL. His casting roots started in making strategic commentaries three years ago, and from there moved on to hosting Team Liquid events TL Attack!, Liquibition, as well as the two previous TSLs. Known for dry Canadian humor, he has a no-nonsense style of casting that hits the critical issues of any game. Sean "Day" Plott is truly a man needing no introduction. For StarCraft: Brood War, Day9 casted the TSL2 and the WCG Grand Finals three times. He hosts Day Daily and has done commentary for nearly every major StarCraft 2 event outside Korea, including MLG, IEM, Blizzcon, and Dreamhack. Day9 brings incredible energy, strategic analysis, and offbeat humor to every event he attends. Marcus "djWHEAT" Graham is a long time commentator of many competitive video games. He has done casting for Blizzcon, MLG, and WCG World Finals. Wheat hosts the popular programs Live on 3, Weapon of Choice, and Kings of Tin, and brings professionalism and experience to any casting team. He is also currently training his son to be the future SC2 bonjwa. Mike "Husky" Lamond started casting games of StarCraft: Brood War over YouTube. Since StarCraft 2's release, Husky has since grown his channel to not only one of the largest in the Starcraft world, but anywhere on the internet. With a passion for the game that few are able to rival, he is also making it big as a SC2 musical star. Known for upbeat, humorous casts he has the rare ability to make any game interesting and entertaining. Dan "Artosis" Stemkoski is best known for casting the GSL and denying high fives. Artosis was a top American Brood War Terran who moved into casting for events such as Blizzcon, the WCG Grand Finals, and the first two TSLs. In 2009, Artosis moved to Korea and gained years of experience covering events with IEG and the eSTRO progaming team. Since StarCraft 2's release, Artosis has become an important figure in the community. Currently a caster for GSL, he is known for his deep understanding of Starcraft 2 and ability to give strategic insight. Artosis will be taking a few days out of his busy GSL schedule to cast some TSL3 games. TSL3 Day 1 has been announced, everything kicks off on Saturday, Mar 19 6:00pm GMT (GMT+00:00). 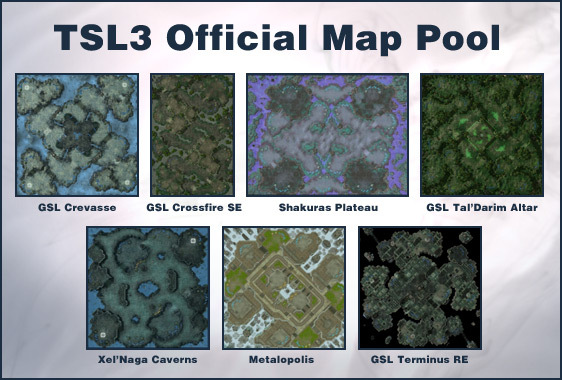 A month ago we announced the candidate map pool for the TSL3. Since then we've gathered opinions of players and fans and have finally reached a consensus. We are pleased to introduce the maps what will be used in the TSL3 main event. Each player will be allowed to thumbs down one map in best-of-three and best-of-five series. Maps will be randomly chosen and ordered of those remaining. Shakuras Plateau has been edited for diagonal position play only, and Metalopolis has been edited to remove close land positions. The bottom of ramps have been modified to prevent easy walling with buildings. Our Blizzard ladder maps are the same as those used in MLG, and the GSL specific maps are the same as those used in the GSL. Special thanks to MLG's Lee Chen, and to Xeph and superouman for helping out. By signing up, you also enter the TSL3 Raffle, where you can win a 5-night trip to South Korea for 2 people to watch StarCraft live in person and tour the oGs-Liquid house. actually nevermind hes been improving lately. Hilarious Artosis gif. Well done. Super excited to see these games. Really glad to see Artosis commentating this one! Check out the cast he did with Day9 of Jinro v Tyler. This is going to be amazing! Artosis, Day9, and Chill casting is going to make this great. WHAT??? No Tasteless I are disappoint. Anyway nice lineup I hope to see the commentators matched to the races being played like last time. That was enjoyable. Regardless, I'm SO excited for this! Great maps, great players and great casters. Oh hell yeah. Awesome!! Can't wait to see the matches. I applaud the decision to only use metalapolis & shakuras cross, it should make for some better matches on these maps. Will enjoy this very much, great map pool. Love that you guys got rid of scrap station as a map. I also appreciate the no close positions on metal and cross for shakuras. We should see some beautiful macro games from these amazing players. Thanks for being awesome. No major complaints about the commentators. It's not possible to have every great commentator for the TSL, so I think they made good enough choices under the restrictions at hand. I wasn't expecting Husky, but I can understand it. Yay husky is casting! While Day9 is the man and great at analyzing, Husky has great passion and knows how to make even less interesting games fun. Artosis has casted every TSL we've had and we'd love if he could cast every weekend. However, he has time commitments for GSL and simply cannot cast at 4am KST every weekend without impacting his schedule there. We mentioned in the post that Artosis is taking time out of his busy schedule to cast some TSL games. As for Husky casting the qualifiers, we tried to have him cast one but the schedules didn't work out. However, he will be available for the TSL3 main. TSL3 is getting sexier and sexier by each announcement. gotta love the edited blizzard maps and GSL maps! TSL3 go go go! SUPER PUMPED OH MY GOD!!!!!!!!!!!!! sorry, i haven't been keeping up with bnet ladder maps but are the changes listed for Shakuras Plateau and Metalopolis changes that have happened online / in gsl too? Husky and Day9 ... gonna be really really interesting. GL with tournament and HUK FIGHTING !! !